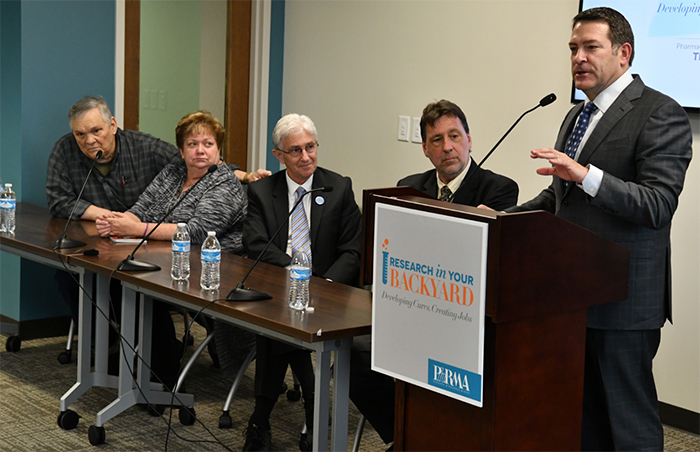 Sen. Mark Green, MD, discusses the importance of local clinical trials and biopharmaceutical research in Tennessee. Pictured (L-R) James and Josi Felts, Dr. Paul Newhouse, Dr. Jeffrey Conn, and Sen. Mark Green. On Jan. 23, the Pharmaceutical Research and Manufacturers of America (PhRMA) released a new report that finds there are more than 945 active clinical trials in the Tennessee. Additionally, the report said the life science industry supports 52,000 jobs and contributes $11.7 billion to the state's economy. "Research in Your Backyard: Developing Cures, Creating Jobs, Pharmaceutical Clinical Trials in Tennessee," was released at an event held at the Cordell Hull Building, which featured a panel discussion by Vanderbilt University Medical Center biotech researchers, Tennessee State Senator Mark Green, MD, (R-22), and a local Alzheimer's disease patient and clinical trial participant. "Clinical trials offer patients novel medical treatments while also allowing biopharma research organizations to innovate and grow," said Green, founder of Align MD. "Across the state - and particularly here in Nashville - the healthcare industry has had a profound impact on our economy." In the United States, there are more than 7,000 open clinical trials being sponsored by the biopharmaceutical industry, universities, individuals and organizations. In Tennessee, active trials are studying treatment options for more than 20 disease sites or types, with cancer trials leading the way by a large margin. Of the 945 open clinical trials involving the biopharmaceutical research industry, Vanderbilt is collaborating on more than 245 of them. In addition, the report cites Meharry Medical College, Sarah Cannon, Clinical Research Associates, Tennessee Clinical Research Center, Tennessee Oncology, Tennessee Retina, and all of the city's major hospitals and health systems as active participants in Nashville. "Many top universities call Tennessee home and are centers of innovation," said Jeffrey Conn, PhD, director of the Vanderbilt Center for Neuroscience Drug Discovery. "Maintaining strong partnerships between medical universities and life science companies allows us to foster developments right here in Tennessee that can then help save lives far beyond our state lines." On average, it takes approximately a decade for new medicines to go through the FDA approval process, and only 12 percent of drugs successfully make it through clinical trials. Since 2004, biopharmaceutical research companies have conducted more than 6,100 clinical trials in Tennessee.